Chemo brain is a topic that has been trending a lot lately thanks to some new research and a clearer understanding of patients' needs post transplant. When I last saw my post-transplant nurse, Karen, for a biannual followup, she took me through the paces and mentioned a new program being developed in conjunction with the neuropsychology brain trust at MDA. I filed the information away, thinking that I probably wouldn't need to take advantage of it since I was coping with my chemo brain just fine. Yesterday, I had to admit to myself that things weren't altogether copacetic. It took me over three hours to make dinner. You may wonder what the one thing has to do with the other and what amazing concoction I was attempting. Quiche and sweet potato soup. Eggs and soup. Three hours of activity, none of which was passive. Chemo brain is something that I've been struggling with for months now. People may smile and joke and say things like, "Blame it on the chemo brain," or "I must have chemo brain by proxy." I can't even smile about it anymore. It took me three hours to break eggs, peel vegetables, and get things into the oven. When I discussed the situation with Chris, he did his best to reassure me that I'm still the same person I've always been and that I shouldn't be so hard on myself. This is one of the million reasons I love my guy. He was worried that I was beating myself up for not being able to do things that were once second nature. Trust me, I know I'm still the same Ann. All of my inherent Ann-ness is intact. My personality hasn't really shifted. It's my ability to think that has me confounded. We've had the chemo brain discussion more than once and I ultimately had to use the one phrase that makes me insane with irritation to end the confusion: You can't understand. I hate this phrase. For me, hearing this leads me to think that a person is copping out of a debate or that I'm failing to adequately explain something. Imagine walking around in a gelatinous fog 24/7. Now multiply that by 100. I feel like my head is filled with cotton batting. I can't process long tracts of text in a single sitting. It takes me ages to read a single magazine article and I don't always understand what I've read. When I'm trying to hold a conversation, it's not unusual for me to just stop talking mid-sentence without having finished the thought. I substitute words that mean one thing, but sound similar to another. I don't mean homophones, either. Yesterday, I said Scot, when I meant to say stop. I heard stop in my head. I'd intended to say stop. I said Scot instead. Things like that happen with great frequency on a daily basis. Chris and close friends that I speak to regularly anticipate it happening. They let it pass without comment, which I greatly appreciate. I usually keep my cool and correct myself, or at least slow down long enough to make fewer mistakes. I can plan things out and make lists to help me keep on track. For instance, I planned dinner yesterday. I had all of my bowls lined up, the spices were all measured, and all of the vegetables I would need were on the counter within easy reach and the utensils were at their stations. It does take me a little longer than most people to get things done because I don't move as quickly as I once did. Every action requires thought. That's not why it took me 3 hours to make a quiche and a pot of soup. It should have taken me an hour, tops. It took 3 hours because I was trying to multi-task. Rather than cook a quiche, then make soup, I was trying to do both at once so they'd be ready at the same time. It doesn't sound complicated and I'm sure there are some of you who are wondering why I'm droning on at length about it. It's because it's not complicated and therein lies my frustration. This was the final straw in a long line of similar events. I can no longer do things in a linear progression. What makes perfect sense one minute becomes a complete quagmire the next. I'm not alone in this. I've spoken to other patients who've related similar anecdotes. Mention chemo brain and we all sport similar looks of resigned understanding. This makes me very worried regarding taking classes at LSU inorder to finish the CM degree. I refuse to let it deter me, but I don't know how to make it stop frustrating me. I accept the fact that I need to learn a new way to learn and that things will no longer come easily to me. I just don't like it. Tomorrow, I'll contact Karen about setting me up with the neuropsychologists. I may be able to get in to see them during my next checkup in three months. Until then, I'll keep cruising along. When I was diagnosed with leukemia by the man who would later become my local oncologist, I asked him how long he thought treatment would last. He estimated that I could be done in about four months. I understood then that he wasn't giving me a hard and fast guarantee, and I understand now that he was giving me a best case scenario. As Chris likes to say, hearing that I had leukemia was like someone throwing a flash grenade into the room. I became fundamentally functional when I heard that pronouncement and the survivalist lurking in the primal part of my brain took over. Thinking that I would only be away from my home for a few months and still reeling from the cancer diagnosis, Chris and I stepped out of our everyday lives leaving things where they laid. I left dirty clothes in the hamper and laundry to be folded spread out on the couch in our bedroom. There were dishes in the dishwasher and the house could have used a thorough once over. I knew I'd be back, so those things were going to wait for a later time. I never set foot in our little townhouse again. Strangers hired by a family member packed up our things and placed them in storage. We'd been in the midst of a kitchen renovation and I'd been slacking on finishing the final details, so the doors from the upper cabinets were missing . They were stacked in various places, waiting for me to finish painting them. The house was sold with a thousand tiny projects left to be finished when we realized that we'd need the money it could bring to help finance treatment. I'm only bringing this up now because I'm about to confess something that I've begun doing recently. Since we moved into our current house in June, I've begun a little ritual before each trip to Houston. A few days before we're scheduled to travel, I begin tying up loose ends. Every single item of laundry is washed, pressed and put neatly away. The house is cleaned from top to bottom with a critical eye turned to every little detail that may be scrutinized by a potential buyer. I've done this quietly and stealthily so as not to alert Chris to the fact that I worry about a relapse. I finally confessed to this mania yesterday while we were driving to Houston. It was a relief to expose that irrational part of my brain to the light of reason. My need to put things in order was worse this week than the week prior to my last trip to Houston, three months ago. It was around this time in 2006 when I realized that there was something seriously wrong with my health. Relapse was at the forefront of my mind this time around because I was having my fifteen month checkup just as the most physically obvious symptoms of leukemia began manifesting three years ago. I had no rational reason to believe that the sneaky little monster was back just in time for a non-celebratory anniversary. I felt, and still do feel well. There are very obvious signs of graft versus host disease riddling my face and body. The very fact that I was able to clean a three bedroom house from top to bottom in a single week should have been my first clue that all was well. Three years ago, I couldn't fold a shirt without almost blacking out. That little moment actually happened. I still can't do things as quickly as you, but I'm approaching something that I can live with. Chris and I rolled into Houston armed with goodie bags filled with homemade fudge for my friends at MD Anderson. Thanks to my inattention while driving we arrived fifteen minutes late for my first appointment. After the fastest blood draw I've ever experienced, we made the rounds to deliver treats and visit with people I haven't seen since being released from the 100 day bubble. I got the best reception at the infusion clinic where I spent the bulk of my time post transplant getting blood and IV drugs. Juanita, the first nurse to spot me, actually walked into the center of the bull pen and announced my name in a loud and lilting voice. I found myself surrounded by a small army of nurses who had looked after me on those long clinic days. There were many hugs and lots of catching up while Chris handed out bags of candy to our friends. We also visited the transplant floor of the hospital, looking for familiar faces and physical therapy where we surprised Marigold, my patient therapist. She didn't recognize me until she saw Chris. The fact that I had hair had thrown her for a loop. I finally saw my transplant doctor sometime after twelve. She had some concerns over the skin GvHD on my face and I think she may have been on the cusp of increasing my tacrolimus dosage. The rashes have been an ongoing nuisance for months, but this is the first time that she's actually been able to observe one. She was worried that the last reduction in tacro had spurred a greater frequency of GvH occurrences. I was able to reassure her that I'd been having the problem for months before that and that I was still able to keep things under control with moisturizer and cortisone cream. I think we struck something of a compromise after she extracted a promise from me to report any skin thickening or magnified symptoms. If this occurs, then it's back to a double dosage. All of my medications will remain the same with the exception of magnesium. I get to cut the dose in half so long as I'm only taking 0.5 mg of tacrolimus. We briefly discussed my continuing loss of bone density which is compounded by the fact that I'm post menopausal thanks to chemotherapy. I'll have another bone density scan in three months when I return for my eighteen month checkup. I'll also have to see an endocrinologist at which point we'll discuss taking drugs to help slow the bone loss. For those that are interested, my white blood cell count was 8.1 K/Ul, red blood cells were 3.64 M/UL, platelets were 314 K/UL, ANC was 5.48 K/UL, and ALC was 1.17 K/UL. Dr. K. pointed out that I have an elevated eosinophil count of 0.44 K/UL which correlates nicely with the fact that I'm exhibiting signs of chronic graft versus host disease. She even went so far as to circle the eosinophil percentage, 5.4%, which according to her is the ideal number to be looking for when discussing chronic GvHD. It's just enough to provide a protective barrier against a relapse, but not so grave as to be life threatening. At the eighteen month visit, I'll get my immune system reassessed with particular attention paid to what my T-cells are doing. Dr. K. thinks they'll still be in the low range which would be normal. If the new immune system tests well enough, then I'll have a few more restrictions lifted. We discussed the likelihood of me returning to school to finish the construction management degree. She advised me that I need to take it very slowly since I'll be dealing with learning problems thanks to chemo brain. I've been given the green light to take one or two classes to assess my ability to cope with concentration and problem solving. I've also been warned that my ability to deal with real life stresses will have changed and that I need to be prepared. It's been duly noted. She's also given the go ahead to another idea that Chris and I have been kicking around. In preparation for possibly being able to return to the workforce, we discussed volunteering a few hours each week. It will allow me to see how I handle a work environment and if I'll be able to maintain the stamina needed to get through a day. I'm sure it sounds like minor stuff, but you need to remember that it takes me almost eight hours to vacuum four rooms and I'm usually wiped out for the rest of the day as a result. At the end of the visit, I was able to ask Dr. K. the most important question of the day. Chocolate or peanut butter? The answer was, "Chocolate, of course." Chocolate fudge ruled the day. I'll register for an independent learning class at LSU in the coming weeks and research some local volunteering options. I'm open to suggestions on this if anyone would like to contribute some input. Believe it or not, after returning home from Houston, we had a late night dinner date with out of town friends. It was a twenty-two hour marathon day without naps. By the time my head hit the pillow sometime after midnight, nothing short of a natural disaster was going to get me out from under the covers. At the Chimes LSU, from left to right: Chris, me, Anand, Kurt, and Daniel Martin. A close up of my cheek. The clusters of red are composed of tiny raised welts that itch to perdition and cover my face and neck. They'll eventually become little blisters that dry out and become scaly and flaky. We accidentally stumbled upon this great Vietnamese restaurant on our way out of Houston. Had I known about this place while we were living there, I may have become a permanent fixture. 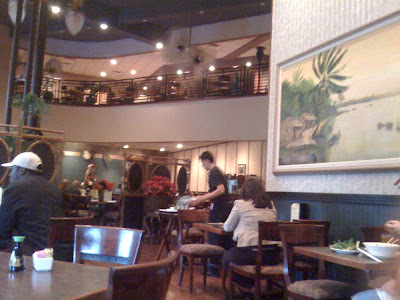 Vietopia is located in Rice Village and serves delicious Vietnamese cuisine that rivals the dishes that I grew up with. The service is spot on and drinks, appetizers, and entrees for two came to $23 before tip. The entree portions were enormous and could easily have made two meals. Close up of my Bo Phon Xao. It's a dish consisting of rice vermicelli, slivers of fragrant lemongrass beef, mung bean sprouts, shaved carrot, green onions, daikon, onion, and chiffonade of lettuce. Heaven in a bowl. It didn't occur to me to take a picture until after I'd mixed everything up and had a few heaping bites. A view of the restaurant from our table. It was just after the lunch rush. Service is fast and pleasant. The young woman handling our table was gracious and attentive. Happy and sated after an excellent appointment and a delicious lunch. Yesterday, I had the pleasure of getting my hair cut and running into a friend that I hadn't seen in over a year. My friend and stylist, Lydia was able to work her magic to help hide the fact that my hair is so thin thanks to all of the treatment. She is an absolute treat to be around and makes the world a better place just by being herself. Those that know her, know exactly what I'm talking about. Laura, Lydia's daughter, was also at the salon and surprised me with a hug and a smile as I walked through the door. I haven't seen her in over a year and I love her to pieces. We used to work together before I was diagnosed and there wasn't a day that went by that she didn't have me laughing at one thing or another. Both Lydia and Laura have a rare gift for making everyone comfortable while being the life of the party. I should have taken the picture yesterday, after Lydia had styled it. She had it in a very edgy, tousled do that I loved. Sadly, I wasn't able to emulate her ability. I'll work on it. I love it, nonetheless. These are for my friend, Lisa who tweeted something about bedhead. This is literally seconds after I woke up this morning. Normally, my morning hair defies physics and those who have had the pleasure of seeing it will assure you that I'm not exaggerating. For some perverse reason, the bedhead wasn't bad this morning. Lisa, I hope this makes you smile. It feels like the last seven days have been full of too many appointments and far too little recreation. The appointments have been of the home maintenance, non-medical kind which is a novelty for me. The dishwasher has a mysterious leak that only happens occasionally and doesn't seem to be due to a faulty gasket. It's already been serviced once this week and yet it continues to misbehave. For the record, it didn't leak while the repair guy was here and he couldn't get it to leak. It leaked for me yesterday and today, so I have another appointment on Friday. The dining room chair epic saga was finally resolved today with the delivery of four new chairs that all stand level. This leaves one chair to be picked up at the store when I can finally schedule it. Kudos to Flo at AFD for taking care of the problem. The skin GvHD is ramped up higher than I've ever had it. My face and chest are covered in a very discernable rash that constantly itches. I've been applying cortisone cream, but that doesn't seem to be slowing things down. I'm hopeful that it's only part of a cycle and will resolve on it's own. I'll see my transplant doctor next week and discuss treatment options. We finally managed to get the Christmas tree up last Monday and had it decorated by Tuesday night. The cats have been having a ball using it as cover while they plan their little ambushes. I managed to finish knitting my super secret project and will post pictures of it once it arrives at it's final destination. I've been working on it since August and now that it's finished, I'm feeling a little lost in the hobby department. Never fear, I've cooked up a new scheme and am working on designing something to keep me busy. I know this is a mess of a post, but I didn't want to let a week go by without a word. We're all doing well and I feel great. Can you spot the reason the tree didn't get decorated on the same night it was erected? It's our very own house tiger, Akiko. Akiko spots her quarry below. Poor Etsuko had no idea Akiko was about to fly out of the tree to pounce on her. The super secret knitting project. I'm taking a break from the things I should be doing--emptying boxes, dusting, cleaning, laundry, to do something that I want to do--blogging. I feel that I've been horribly remiss in all things bloggy and hope to rectify that today with a recap of last week. The temperature in southern Louisiana finally dropped closer to something approximating winter and there were even rumors of snow. You'll have to forgive me, but the white stuff stirs up a lot of excitement down here since it very rarely happens and never lasts long enough. I know people in other parts of the country consider snow a nuisance and I'm sure those of us in the muggy south can relate with our disdain of heavy rain. Over the summer months, I suffered with increased episodes of skin GvHD. The sun and heat set off my attacks and once one gets going, it's difficult to rein it in. I looked forward to cooler weather and what I thought would be a reprieve from rashes, and random stinging attacks delivered by invisible wasps inhabiting the underside of my skin. The temperature dropped. The attacks keep coming. It would appear that extreme cold also triggers my GvHD attacks. My face is covered in big flaky patches that no amount of moisturizer can help. The backs of my hands are raw and covered in tiny welts that will break open if I don't apply moisturizer. My scalp is shedding, leading to what looks like unsightly dandruff. There's another manifestation happening with increased frequency that I heretofore had not mentioned. If any of my extremities get cold, and I mean really cold, then the muscles seize and contract, contorting the affected limb into an uncomfortable angle. It started with my feet and has been happening for close to a year. It only happened occasionally, so I never really thought about it. One foot will become cold for whatever external reason, then I'll start to feel the sensation that precedes a charlie horse. If I don't start moving and forcing the foot to stretch quickly enough, my ankle rotates inward and locks. It's a strange and uncomfortable sensation that lasts as long as it takes me to get circulation back into the offending foot. That phenomenon is now affecting a slightly larger area. It starts with a foot and now migrates up my leg and into my hip. The ankle rotates and locks, as does my hip. It's only happened a few times over the last month and isn't painful, only uncomfortable. I'm making a point of stretching my legs throughout the day and paying closer attention to the signals my body sends out. All of these things are more of a nuisance than anything else, so I'm not worried. I'll mention everything to my transplant doctor when I see her later this month. I can't really account for where all of my time has been spent over the last week. I've been very slowly unpacking three boxes of place settings that I ordered a week and a half ago. They're to replace the dishes that didn't quite make it from the company that handled our move. Somewhere in a warehouse here in town sits a small number of boxes with the rest of my old dishes. A normal person would have contacted the storage company when only three partial place settings were unearthed from the "kitchen" portion of the move. For those of you who are new to this story, my first house was packed and moved by someone other than me since I was in Houston receiving treatment. Someone else found the company and oversaw the affair. It seemed like everytime we had to contact the moving company post move to let them know that we hadn't gotten all of our stuff, we were being charged another $500 for the pleasure of having our things returned to us. Chris and I hit a saturation point and realized that we'd done without our things for three years. If we weren't aware of missing something, then we could live without it. We boxed up some of the mismatched plates, etc and dropped them off at Goodwill. I'll box up the rest of the orphaned dishes today or tomorrow and we'll make another donation run this weekend. Chris is well, the cats are well, and I am well which makes for a very boring week to write about. We like boring. It did snow the other day. Big fat flurries that dissapeared as soon as they hit the wet pavement. The pictures below were taken in our backyard. A few weeks ago, my friend Heather called me with a question. We've been friends for 24 years, ever since she was seated at my table in home room. I haven't seen her in 15 years, but she always manages to make sure we stay in touch. She wanted to know if we could meet when she, her husband Jeremy, and their two little ones passed through Baton Rouge on their way home from visiting family. I had to clear it with my transplant doctor since the girls are literally babies. Mia is 2 years old and Kiley is 8 months. I'm still taking immunosuppressive drugs and have been advised not to be around children. Dr. K. said it would be fine so long as the girls were healthy. Heather has been manically trying to keep the girls well so we could pull this off. I'm thrilled that she pulled it off, since we were able to meet for lunch today and I finally got to meet her husband and two beautiful little girls. At the Acme Oyster House. Heather and Jeremy got there a little ahead of us and managed to snag a table ahead of the lunch rush. It's a game day for LSU, so the place became standing room only shortly after we got there. We went for gelato after lunch at Latte e Miele. The gelato is unbelievably good. The owners are from Rome and they definitely know their stuff. The gelato is all hand crafted from fresh, local ingredients and the owners are always behind the counter with a smile. If you're ever in Baton Rouge, you should definitely drop in and have a bite or two. I know it looks like I'm about to drop her, but I'm actually playing airplane with Mia. A few months ago, I couldn't pick up a 10 pound cat. According to her mom, Mia is 30 pounds of squirmy, giggly goodness. I had a blast playing with her and making her laugh. Mia and her strawberry gelato. I know just how she feels. I think I make the same face while I eat gelato. Kiley ate most of Heather's gelato. Every time Heather tried to have a bite herself, Kiley would fuss. Then she started staring down her sister's cup. She's definitely a girl after my own heart. I was going to title this post "Our first turkey day...", then realized that it wasn't. Last Thanksgiving, I was still in the 100 day post transplant cocoon, living in a one bedroom apartment in Houston and severely restricted. Chris and I celebrated with steak and mashed potatoes. My steak was cooked to perdition to guarantee safety and the mashed potatoes were instant. We were just so happy to be together that it didn't matter. This year, we also celebrated alone, but it was blissful since there was no set schedule and it didn't matter if the asparagus finished cooking before the potatoes. We finally bought dining room furniture after 15 years of either hunching over the coffee table or eating at the pass through. The table and chairs arrived two weeks ago, with a hitch. Four of the six chairs had one short leg each. The delivery driver caught the defect on one of the chairs and left it on the truck as a refused delivery. I didn't discover the other three until after he'd left. I won't pain you with the finer details of dealing with the furniture distributor's service department. Ultimately, four new chairs were ordered with the intention of swapping the defective ones out. The four chairs came in last week, with the same defect. The service manager ordered another four chairs and replacement legs one week ago yesterday. I haven't heard anything since. I'll name names in another post depending on how things resolve. Ultimately, there are two chairs which is the perfect number for just us at the moment. I would like the other chairs, though, since they have been paid for. We had a really nice day and I managed to sneak in a nap. Aside from a GvH flare up of my skin, everything else seems fine. My head and torso are covered in a fine rash in varying stages of intensity. My forehead and abdomen are suffering the brunt of my immune system's aggression. You won't be able to see it in the pictures, but trust me, it's not pretty. I've been using minoxidil for almost a month now and have noticed that my hair isn't falling out as much. I probably won't see any new growth for another month if I get any at all. In the mean time, I'm better able to camouflage the diffuse thinness. Again, the pictures won't show the finer details. It looks like I have a full head of hair, but trust me, I don't. I still have the monk's tonsure and overall thinness/diffuse baldness. If new growth doesn't start happening by the end of week 8, I'll get serious about a wig. Believe it or not, that's my plate. This is one of my favorite wines. It's got a really agressive, rich flavor with just the right amount of earthiness and a smooth, smoky finish. I discovered it four or five years ago when it was a paltry $6 per bottle. This is the first time that I've bought a bottle since I was diagnosed and it took me forever to find it since the label has changed since last I saw a bottle. It's now $14 per bottle which leads me to believe that the secret is out on this little gem. I'm not allowed to have alcohol yet, so Chris had to fly solo on this one. Sweet potato pie and my hand vac that I forgot to put up. Akiko's first Thanksgiving. Once she got a taste of turkey, she had to have as much as she could beg off of Chris. Believe me, she was persistent. Etsuko wasn't interested. She's a big fan of cat kibble and would rather have that over people food any day. That doesn't stop her from wanting to see what's on your plate or begging for a little of what you're having. Very rarely does she eat people food. I'm forever having to coach Chris into smiling for pictures. He does the same one everytime he's asked to pose for a picture. One of my most absolute favorite things is when Chris gets a serious case of the giggles. I love his joie de vivre when he loses himself in something silly and can't stop laughing. It's usually at something I've done, or inadvertently said. I managed to get him going while I had the camera out. He's requested that I not post the pictures, but I'm afraid I have to for posterity's sake. You get to see him smiling candidly and it's one of my favorite images. Lastly, this is my little brother, John. My sister-in-law forwarded this to me yesterday. John's just finishing Navy bootcamp and I couldn't be more proud of him. He's a southern boy freezing his tail off in the mid-west at the moment. I know Mandie can't wait to see him once he graduates. He is the spitting image of our dad, who I know would also have been proud of John. I am so full of carbs and butter, I won't even attempt to post something decent tonight. I will post pictures tomorrow. The turkey has been brining since Monday, the sweet potato pie and corn pudding have been baked. The veggies for the dressing have been chopped and sauteed. The rolls have been formed and are being held in the fridge. There's just a handful of things left to do which should make for a relaxing day tomorrow. I'll post a recap tomorrow night. Until then, I hope everyone celebrating Thanksgiving has a wonderful day full of blessings. For those who don't celebrate, the same hope still applies. The last three numbers pertain to my liver and are trending down nicely. The AST/SGOT is within normal ranges. The ALT/SGPT is on the very cusp of being normal and the ALK PHOS is a little over double the high end of normal as opposed to being three to four times normal as it has been in the past. The next checkup is in Houston two days before Christmas. A few years ago, Chris and I took a long overdue trip to California to see my extended family. While we were there, a group of relatives, including my tiny grandmother brought us to a small Buddhist temple to pay our respects to my grandfather who had passed years earlier. Chris and I speak little to no Vietnamese and so we tended to orbit one another while my aunts and uncles visited with the monk holding vigil that day. For a short period, I found myself standing with one of my younger aunts while she had a conversation with the smiling monk, listening to the sing-song cadence of his voice as he spoke at length. There was a long pause during which my aunt started to giggle. As it turns out, the monk had been speaking to me the entire time I'd been daydreaming and looking around the temple. My aunt explained to him that I only spoke English and he had a good chuckle over it all. I should have had a laugh myself, but the experience made me feel out of sync for the rest of the day. What must that poor man have been thinking as I looked at everything but him? This theme continued throughout our visit at dinner parties and shopping excursions. Guests or proprietors would talk to me without me being aware that I was the focus of their conversation and I would continue doing whatever it was I was doing at the time. The point I'm so inelegantly trying to make is that I look Asian and while in the company of my relatives who are multi-lingual, most people assume that I am as well. As a child, I spoke fluent Thai. No one else in my family did, including my parents. I learned it from the maid while we lived in Bangkok. I wasn't fluent in English until I was about four and I learned it from watching Sesame Street. I've always been the one that was just outside of the norm. I've felt out of sync this entire week. I've been doing a lot of things out and about solo and realize that while wearing a hat, I look just as average as everyone else. Except, I've forgotten how to speak the language. I find that I'm no longer comfortable doing some of the pedestrian, mundane things that I used to do. An errand to the Apple store to have Chris's computer serviced left me frazzled. An impulse stop at another shop left me feeling isolated. A visit with a local opthamologist found me floundering for words. These are the everyday things that I've been aspiring to do since I've been transplanted. I thought I was sick of having to buy everything off of the internet. I longed to be able to try clothes on in a shop. All of the little nuisances that add up to a normal life now are so foreign to me that I marvel at being able to do them at all. The very act of asserting my independence has left me feeling disconnected. A visit with my local oncologist yesterday put the entire week into perspective. Dr. B. came in, reviewed my counts with me and asked me if I had anything new to tell him. I slumped in my chair, shook my head and said, "Not a thing." He smiled and told me that my counts were perfect and everything looked normal. He checked my head and neck for unusual lymph nodes, then did the spleen check and pronounced everything normal. We went through the perfunctory checks for heart and lung functions. Normal. As I left with a copy of my counts in hand, he reiterated to me that I was the best looking transplant patient he'd ever seen. Someone else remarked that you'd never guess I'd had anything done to me. So I suppose this entire week has been a test of my patience and my nerves. As for how I did, I'm still standing and will have to work on embracing life as a normal person. There will be hiccups and I will stutter, but I'm determined to relearn how to speak the language of the everyday. An acute pain on my right side woke me up around 4am on Sunday. It felt very much like the same pain that was diagnosed in August and September, so I went back to sleep and thought nothing more of it. When I finally got up that day, I took 2 aleve thinking it was the same inflammation that had led to the partially collapsed lung. By midmorning, my entire abdomen was swollen. The acute pain was more severe and I was loathe to move around because of the discomfort. By that night, it was painful to lie down, so I slept sitting up, thinking that things would resolve in the morning. By Monday morning, it was painful to stand due to the abdominal swelling. Chris took me to the ER where I had x-rays and a CT scan as well as blood work. My white blood cell count was 10.9 which sent me into a moderate panic. All of my other numbers were normal for me with only one liver function test coming back slightly elevated. Normally, I return with 3 on the high side, so I guess this was a plus. The ER doctor didn't think anything looked amiss and chalked the high WBC up to being a response to the acute pain I was feeling. The x-rays and CT scan showed nothing nefarious. There was a large deposit of material in my right transverse colon which was exactly where the most acute pain could be found. It would seem that my digestive system had stopped functioning normally, again. I was given an injection of anti-inflammatory meds via my IV line just in case there was any pleurisy and sent home with instructions to get plenty of fluids and take a few over the counter meds. The acute pain has subsided and the swelling of my abdomen has lessened The muscles are all sore from being stretched for the last few days. I plan on staying close to home for the next few days. With transplants, if it's not one strange thing, it's another. It's been one week since the sore throat manifested and I feel really well. There's still the issue of a lingering runny nose, but it does get noticeably better every day. In the past, before cancer, I could shake a cold in a few days, a week at the very most. This cold is literally my first since the last transplant, and I find that it's resolving in stages. First the sore throat disappeared, then the congestion, and now I'm waiting on the water works. My energy level is back to where it was and my appetite is excellent. I just need to be patient and understand that this immune system is having to find it's way in a foreign environment. One strange thing I noticed while I was sick was a significant reduction in the occurrence of skin GvH flares. I assume my immune system was busy trying to figure out what was going on with the cold and took a break from torturing my skin. As the cold resolved, the skin GvH ramped up. Today has been particularly difficult in that regard. On a scale of 1 to 10 in comparison to other transplant patients' GvH issues, I'd rank mine a 2, maybe a 3 on my worst day. The skin issues manifest as itching, rashes and dry patches. Today, there wasn't a single inch of me that didn't feel like it was covered in poison ivy; especially my scalp. At the moment, the itching is a low level hum on my face and feet, but that could change at any time. As for what I've been doing with myself since last week, there are only a few things to report. Chris's dad and step-mom are in town for a few days and last night we got to have dinner with them which was really nice. We had the opportunity to visit them last year right before I relapsed and I can honestly say that they live in one of the most beautiful parts of the country. We had our first Halloween in the house which was a lot of fun. Before cancer, we had a townhouse in a residential development that had a few kids, but there were never trick-or-treaters. Since we don't have kid ourselves, we weren't really sure of what to expect. I have friends in other parts of the country who take their kids to organized events instead of letting them go door to door like we did as children. I emailed the home owner's association to get a rough idea of how much candy to buy. We hadn't received a reply the week of Halloween, so we just guessed based on the size of the neighborhood. The subdivision is so large, there are 2 homeowner's associations, and based on that, we bought a ridiculous amount of candy. A few days later, we ran into our next door neighbor and she told us to expect maybe half a dozen kids. I made a point of getting candy that I loved as a child, so I wasn't heartbroken to hear that I'd probably be eating candy for the next month. Chris is trying to lose weight, so he was definitely worried. Chris started getting really excited about the holiday and wanted to decorate the yard and windows. I know he's going to be a really fun dad because he's already making plans for something big next year. Keep in mind that he's an engineer, so there's probably going to be lumber and motors involved. We had way more kids than we expected and had just enough candy. The first set of kids showed up at 5:30 just as we finished putting the yard decorations up. I happened to be in the kitchen, which faces the street, when I saw a tiny blur tearing across our lawn. I could make out a tiara and a frilly little tutu as she whizzed past. There was a steady stream of kids until 8:15 and Chris and I had a blast handing out candy. The kids were mostly of the under 10 set and were all precious. I'm really looking forward to doing it again next year. I poured all of the candy into a bag to mix it up. Chris is posing with it to give perspective. I am sick. There, I said it. I managed to go almost 14 months post transplant without catching a single pedestrian virus or bacterial infection. Almost. Wednesday I woke up with a sore throat. I didn't think anything of it and chalked it up to mouth breathing while sleeping. It happens. When it didn't resolve within the hour, I called my local oncologist to see if he could fit me in. His schedule was packed, so the scheduler forwarded me to the nurse's voicemail. I left her a list of my symptoms; sore throat, head congestion, no fever. Sheryl called me back to get a more complete picture of what was going on, then told me to sit tight while she consulted with Dr. B. They would either squeeze me in or call in a prescription. Chris checked in with me while I waited and I let him in on what was going on. We're both a little gun shy of mysterious sore throats. The first mystery sore throat led to a diagnosis of PTLD after the first transplant. Pre-Lymphoma is a very scary thing. The second mystery sore throat was the leading indicator of relapse. This sore throat feels nothing like those two. For the first time in forever, this feels like a legitimate cootie. I tried to explain the difference to Chris, but I could see that he wasn't sold on it. He took the rest of the day off of work to come home to monitor me. I felt bad that he did because there wasn't really anything to monitor. My local team decided to call in a prescription for Z-pak. Sweet, sweet Z-pak. The pharmacy didn't have it ready until almost 5pm and I didn't get out of the house until around 6 to get it. I've got the first dose under my belt and will take the second later this afternoon. My throat is still sore and phlegmy. My nose is running and my head is still congested. No fevers as of yet and I'm doing my best to stay hydrated. I've pinpointed the exact person who passed this on to me. It was an old acquaintance that I ran into at the grocery store on Sunday. I hadn't seen her in at least 5 years and she had no idea of what's been going on. She'd already hugged me twice before I realized that she might have a little something. It was when she was walking away that I heard her cough and clear her throat. Grrrr. I know she had no idea. It's just one of those things that happens innocently enough. I was bound to catch something sooner or later. The house is a wreck and will continue to be so until I feel a little better. I'm thankful that there are frozen left-overs, so I don't have to actively cook. Unless you count making rice, which I don't. I did manage to run for the first time in years on Tuesday. It felt like coming home after such a long hiatus. Of course, all of the old complaints made themselves known within minutes. The weak ankles and shoddy left knee that likes to pop every few steps were in full effect. I got in half a mile before I decided to powerwalk the last mile. I am and will always be a slow runner. At my peak, the best I could do was a seven and a half minute mile. That was in my late teens and early twenties. Those days are long gone. The thirty something me plans on babying her joints and running recreationally. There may be a 5k in my very distant future, but that is it. No marathons here, thank you very much. This week is a complete wash. I plan on sitting on the couch and knitting until I feel better. Maybe Chris and I will get around to a little furniture shopping this weekend. We still don't have a dining table and the fold up card table in the dining room is starting to look silly. We'll get something in there eventually. I got a call from one of the BMT coordinators at MDA a few minutes ago. Lori is constantly buried in work, but always has the time to answer questions or look into things for you, which is amazing considering the amount of stuff she has to deal with. When she identified herself on the phone, it didn't immediately click that it was BMT Lori. I immediately started thinking, "Oh hell, the PCR came back fishy." No pun intended--it's also called the FISH test. She called to let me know that she had my donor's information for me, with the caveat that the donor didn't release any contact information. She has contact information for me if she ever wants to get in touch. I'm just so grateful that she donated and gave me this extra shot at living. Her name is Dana and she lives in Hawaii. I have a little more information that I'm not posting out of respect for her privacy. I'm most surprised that she's local since Chris and I were convinced that she was from Malaysia or another country close to it. We were working from something a different coordinator let slip eons ago. When you really think about it, Hawaii does make sense. There's such a rich blend of cultures that have intermingled over the centuries and it's not unusual to run into Hapas of all kinds. We weren't a perfect match on the Human Leukocyte Antigen front, but she was perfect enough to save my life. If she ever googles me and comes across this blog, I just want her to know that she helped facilitate a miracle and I'll be forever grateful for her selflessness. After all, I wouldn't be here writing this if not for her. As promised, here are two shots of my new driver's license picture. They're a little blurry because of the special film used to deter crafty kids from making fake i.d. 's, etc. I still can't reconcile the face in the picture with my own. There's still a residual fullness to my face that I attribute to steroids. I've also taken close ups of my scalp so you can see what's happening with my hair. I'm almost 14 months out from the transplant and I still can't grow a full head of hair. Dr. K. keeps telling me it's busulfan hair and will grow back. I've done a bit of research and found that as a result of receiving busulfan, I'm lucky to have what I do. There isn't a lot of data available on the net, but from the little I've found it appears that busulfan doesn't actually cause your hair to fall out if given during regular chemo. I assume this to mean while you actually have hair and are just beginning a regimen. For those who have received busulfan after transplant, hair regrowth becomes a problem. A study that followed transplant patients who received the drug post transplant showed that a very large percentage had spotty regrowth and diffuse alopecia. I'd say I fit the mold. My stylist is wonderful and has done much to make me presentable, but when something doesn't exist, you can't pretend that it does. I wish it didn't bother me as much as it does, but I feel like this is the last road block to passing as normal in public. I do occasionally go out without a hat, but find it's easier to cover up to avoid the curious stares and questions. I worry that it will make it difficult to conceal the fact that I've had cancer when I'm finally able to go back to school or start interviewing for jobs. It's such a petty vanity when I consider all that we've fought for and I wish I could rise above it. Unfortunately, I'm only human and haven't been able to find a way to cope with it. I've started researching wigs online and my stylist has given me the name of a great place to find a wig in town. I just haven't been able to reason myself into actually buying a wig. I feel like I'll be giving in, but at the same time I'm sick to death of dressing like I'm 12 to make a baseball cap seem like a reasonable accessory. My transplant PA has given a thumbs up to the minoxidil route. Chris is wary of me introducing a new chemical to my regimen and so I'm holding off until he feels more comfortable with the idea. Right now, I just want to pass for normal. As for more mundane things, I baked cupcakes to celebrate my 35th birthday. They came from a mix, but were frosted with chocolate ganache frosting made from scratch to give them a little cache'. For those interested in the frosting recipe, it's 12 ounces of semi-sweet morsels and 2 cups of cream heated over medium low heat. You have to constantly stir it until it reaches the consistency of loosely set pudding. It takes about 30 minutes and is well worth it. It's very much like the center of a dark chocolate truffle. Once it comes off the heat, you have to refrigerate it for a few hours until it's cool. If you over heat it, the fat separates and it won't set on it's own. This happened to me last night, so I poured the entire concoction into the stand mixer and whipped it on medium speed for 15 minutes until it came back together. I managed to eat two cupcakes for lunch before I had to raise the white flag. The ganache is rich. This is the first birthday in three years that wasn't spent either in the hospital or in the clinic. I'm going to finish celebrating by folding some laundry. Who says the life of a transplantee isn't glamorous? As you can see, I'm still a little low for red blood cells and the two numbers associated with my liver function are still elevated. They are down from my last visit, though, so I take this as a positive sign. Dr. B. told me that I looked the best that he's ever seen me since I've become his patient. Kudos. I'm just happy to be here. The scariest part of today's visit was the waiting room. It seemed that every other person either had the sniffles or a cough. Seeing as there were very obviously a few individuals undergoing chemo, I was surprised to be the only one wearing a mask. I often wonder if these patients are being non-compliant, or simply don't realize the seriousness of their situation. Of course I've been tempted not to wear a mask, but when I weigh the potential consequences versus my own comfort, compliance always wins out. I just don't love enforced confinement in a hospital room. I've already scheduled my next visit for November, so I can check that off of my list. As for running this week, it's not going to happen and it's all my own fault. I banged the top of my foot on the door well of Chris's car on Sunday and much like a paper cut, the residual pain seems out of proportion to the injury. It was my own fault for not picking my foot up high enough and I do feel ridiculous for having let it happen. There's a bruise on top of my foot and it's very uncomfortable to wear a lace up shoe. I tried and managed to walk on Monday, but in doing so, I seem to have irritated the injury site in the process. I'll get back into the swing of things next week. I plan on renewing my license tomorrow, so stay tuned for further hi-jinks. I promise to post the picture so you can see exactly what is happening with my hair. Can't wait to enjoy four years of looking a little off on my ID. The following question is my kryptonite: How are you doing? The moment I am asked this question, I become incapable of forming a coherent thought. I know that the person asking wants to know about my current state of being, but after three years of doing the cancer jig, I still haven't come up with that perfect, all encompassing answer. The one phrase that will satisfy that need to connect and effectively communicate my actual state of health constantly eludes me. I understand that some people ask as a courtesy and are hoping for a simple, "Fine." I have other friends that are looking for in depth detail of what's going on medically and are willing to sit through thirty minutes of medical jargon and blood counts with chemistry panels thrown in for good measure. There are still others who want to know what's going on emotionally as well as physically. Then there are those who use it as the opening parry in a game of competitive woe. I had that conversation yesterday with someone who has known me for my entire life. 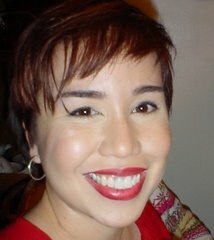 I love this person and understand that they have a very unique perspective of the world around them and their place in it. We don't always get along, but this is true of many long term relationships. She asked, "How are you?" Before I managed to get two words out she launched into the minutiae of every wrong done to her by a small coalition of people. 20 minutes went by before she paused for breath. 20 more elapsed before I realized that my cancer diagnosis was one of her woes. She wasn't upset that I had cancer. She was upset that the fact that I had cancer was happening to her. I refuse to play the competitive sport that is "poor me." I cannot relate. If you want to compare notes for the sake of understanding how your illness relates to mine, I am there. If you want to pick my brain for what I know about leukemia, I welcome all inquiries. I want my experience with cancer to be informative to other people who may be overwhelmed by their own diagnosis. If you need help or a spare ear, I'm your girl. Now, if you're going to use the fact that some latent genetic switch accidentally flipped on causing cellular anomalies and all around fun in the form of blood born cancer in my person as your personal cross to bear, then I have a problem. It's an unfortunate situation that I'm realizing happens more frequently than not to people diagnosed with a life altering illness. I'd be interested to know how other patients deal with it and the overall outcome. The person to whom I referred earlier doesn't read the blog. I know for a fact that she's never touched a computer, so this isn't a direct message to any one person. I just felt that I needed to be honest about a residual issue related to my recovery. I don't think I'll ever be able to answer the question, "How are you?" adequately in an extemporaneous platform, and so I'll stick with the answer that I usually give. I'm fine. The diaphragm issue isn't bothering me this week. I've been walking 30 minutes each day to combat osteopenia. It's been going well and I've been able to steadily increase my speed. I'm pretty confident that I'll start running next week and am excited to be able to join the ranks of PJ, Ronni, Susan, and Jim. I definitely won't be in the same class, as they are all serious runners and Jim is currently training for a marathon, but it feels good to look forward to doing something that I used to love doing. Since I still have issues with GvHD and heat, all of my running will be accomplished on a treadmill indoors. Chris is doing well and staying busy with work. The cats have managed to stay out of the vet's office this week and are creeping closer to being buddies. I caught Etsuko grooming Akiko yesterday. Akiko tolerated it for a few minutes before it was time to wrestle. My brother got married on his birthday and started basic training for the Navy last week. It's been an eventful week on a personal front and I can say with all honesty that life is amazing and I really am doing fine. Concerning the rash I mentioned in the last post, my doctor felt that it wasn't GvHD based on the burning sensation. Since she wasn't able to see it, she had to base the tentative diagnosis on my symptoms, which I don't think I did a very good job of describing. She was leaning more toward a fungal infection and prescribed an ointment accordingly. The rash disappeared the day I heard from the team and I forgot to apply the ointment. Bad patient. I still tend to believe it was more related to GvHD than not, since I've been having skin flares since the prograf was reduced. I have another appointment with my local oncologist this month to have a chemistry panel pulled. Aside from this, there's not much else going on. I keep starting and stopping this post, frustrated at my inability to collect and order my thoughts, so it's probably going to be a bumpy ride from here on out. My transplant doctor reduced the amount of tacrolimus that I've been taking from 1mg a day to .5mg a day and I'm already starting to see the difference. My opening statement not withstanding, I've felt more capable on a mental level. I don't feel quite as slow as I did on the higher dose and I'm looking forward to getting off of the drug completely. Since the immunosuppressant dose has been reduced, I've had a GvHD flare of the skin. The backs of my hands are fairly raw and red and look like they belong to an eighty year old woman. The texture is scaly and if I don't keep them constantly moisturized, they get really irritated and start to hurt. A small rash appeared on top of my left foot Sunday night. It's a small patch no more than an inch and a half long of slightly raised red skin. If you apply pressure to the spot it feels like a minor bruise. When something brushes lightly against it, there's a burning sensation like someone is holding a flame too close to the skin. When I wear shoes that cover the spot, the burning sensation is constant. I've been applying cortisone cream to no avail. There hasn't been any change. I sent an email to the team and spoke to my nurse a short time ago. My doctor's out today, so I should know something tomorrow. It's a non-emergency, so I'm not worried. Tuesday I started feeling queasy mid-day and by late afternoon I had vomited once. I haven't been feeling sick and I haven't been running a temperature. If you've been following the blog for a while, you'll remember the bout with PTLD(pre-lymphoma). Whenever I vomit for no discernible reason, I always worry that it might be coming back. This doesn't feel the same and I have to remind myself that I've had two CT scans in the last two months, so if something was going on, it would have shown up. The same thing happened today. I don't feel unwell and I felt perfectly fine after I was sick. I'll let the team know and see what they want me to do. I suspect that I'll be seeing my local oncologist just to get looked over. On a much more positive note, the pain in my chest has resolved. I can take a deep breath and only feel a slight tightness at the bottom of my rib cage. Yesterday, I got a case of hiccups and it was a very surreal moment when I realized that only the left side of my chest was fluttering. This leads me to believe that my doctor's suspicions are correct and that I do have a partially paralyzed diaphragm. I'd like to thank everyone for weighing in on the chiropractor. I've really been thinking it over and after talking to a friend who's specializing in internal medicine and taking my doctor's reluctance in approving the move into account, I've decided to forgo it. In my mind, the cons outweigh the benefits. I'll post when I hear from the team tomorrow. Sorry I didn't post last night, but it was late and I was really tired after the long drive from Houston. I was told Wednesday that I would be having a CT scan with and without contrast, so I shouldn't have been surprised on Friday when the nurse presented me with a barium smoothie. I also shouldn't have been surprised to see a small bolus of barium when I went in to have the CT scan, since I was having a pelvic series done. If you don't know the significance of the bolus, don't worry about it. If you do, my sympathies. Dr. K. called me while I was navigating Houston's rush hour traffic in a bid to get home. Lucky for me I was trapped in a school carpool lane at the time and wouldn't be going anywhere so long as the crossing guard had his way. The CT scan didn't show anything unusual. This finding lead Dr. K. to theorize that my phrenic nerve has been partially paralyzed. This is the nerve that, for lack of a better description, coordinates the movement of the diaphragm. So, the right side of my diaphragm is stuck in the up position which is causing the pain when I breathe. There's nothing to be done for it and as far as I can glean, it's not life threatening. I'll be going back to Houston in December for a three month check-up and we'll repeat x-rays, etc. to see what's going on with my diaphragm. The paralyzed phrenic nerve isn't a definitive diagnosis and anything could happen between now and then. *I'm not sure what's going on with the date in the header. I actually wrote and posted this on Thursday, Sept. 24. The appointment occurred on Wed., Sept. 23. Thanks for catching it Ronni. Yesterday was an extraordinarily long day that started at 2am and didn't wrap up until midnight. My first appointment in Houston was at 7am and since I couldn't get it moved, Chris and I left the house at 2am for the five hour drive. I'd managed to get a solid 4 1/2 hours of sleep before we had to leave, so I took the first shift driving, giving Chris a chance to sleep on the way up there. On the schedule for the day was a 14 vial blood draw, bone density scan, complete pulmonary function test, bone marrow aspiration and biopsy, one year transplant survivor follow up visit, and a meeting with my transplant doctor. The first two events were fairly routine and done within a matter of minutes. The complete PFT took longer than it ever has in the past. It involves a series of breathing exercises to measure the capacity of your lungs and can usually be completed in under 15 minutes. I had to repeat the first test 7 times because I kept failing it. I didn't fair any better with the next two. While trying to fill my lungs to capacity, I developed a pain in the right side of my chest. Every time I felt it, I would stop inhaling which directly impacted my results. I told the tech about it and he felt that it shouldn't be an issue. When I met with the APN for my BMT survivor meeting, she showed me just how poorly I had done on the PFT's. She had results from the last two times I'd taken the tests. One directly after my transplant and one the day I was released to return to BR. I'd lost about half of my ability which is definitely not good. I was also given the results of my bone density scan. I've lost over 15% in both of my hips which means I'm now osteopenic. This is just a step up from osteoporosis and explains why the PA doing my bone marrow biopsy kept complaining about my bones being soft. Normally, they complain about how dense my hip bones are and how hard it is to get a sample. To help slow the bone loss, I have to do weight bearing exercises and start taking supplements again. I was taking calcium and vitamin d following the transplant, but had to stop in December when my liver started acting up. My team has shifted their view of the risk/benefit of supplements to my health versus not taking them and babying my liver. The tests that measure my liver function are still elevated and my iron levels are still too high. At some point, I will probably have to take drugs to help my liver shunt the extra iron it has accumulated due to all of the blood transfusions that I've had to have over the course of the last three years. At the moment, my doctor wants to continue monitoring the situation. I discussed the chest pain that I was having during the PFT's with Dr. K. and she speculated that I might have a cracked rib or a lesion on the bone. Just to be safe, she ordered x rays of my chest and ribs and asked us to stay overnight in Houston so I could have a CT scan today. The x rays showed that my ribs are fine and that there are no lesions or breaks. The right side of my diaphragm appeared elevated and according to my doctor, appeared to be getting irritated by something underneath it. This makes sense, since the position of the diaphragm correlates to the site of the pain. The only appointment that I could get for a CT scan today was at 8pm so we elected to have something scheduled on Friday. We drove home so Chris didn't have to miss anymore work and the plan is for me to drive to Houston on Friday. Chris is hesitant to let me do this alone, but he recognizes that it's something that has to be done. I feel fine and so long as I don't take in a really deep breath, I don't have any pain. I'm still dealing with the back issue as a result of the accident. Dr. K. gave me permission to see a chiropractor so long as I emphasize to them that I'm osteopenic. I still have to deal with the claims adjuster to get everything straightened out. If anyone can recommend a good chiropractor in Baton Rouge, I'd really appreciate it. My sole complaint about this visit is that as a result of having a bone marrow biopsy, I can't shower for 48 hours. This is making me a little crazy, but I'll deal. The results from the aspiration and biopsy won't be in until next week, but my blood numbers have improved over last week's and I'm not showing any abnormal cells, so the team doesn't expect anything dire. I'll post more tomorrow night when I get in from Houston and find out what's going on in my chest. Last Sunday evening, my shoulder became stiff and sore to the point that I really didn't want to do much with my right arm. Tuesday evening, I began to feel very small tremors in my back. I've never had back problems, so I didn't recognize this signal for what it was. By midmorning Wednesday the spasms in my back were so bad that all I could do was lay in my bed. I have a very high threshold for pain, and this was debilitating. To put things in perspective, I felt like a turtle that had been pushed onto its back. I could only lie in the bed clenching and unclenching my fists with each contraction. Each time I tried to get up, my back would begin to convulse to the point that I didn't want to breathe. I have a prescription for ativan and I thought that if I could take one, I might relax enough to be functional. Unfortunately, the ativan was on the opposite side of the room and I couldn't form a coherent plan to get them. Lucky for me Chris called while all of this was happening. He came home and got me settled. Thursday I saw my local doctor who drew blood and checked me out. He was surprised that I'd managed to get to my age without having any back problems. Since he's only a handful of years older than me, I was surprised to hear that he had back problems at all. He prescribed an anti-inflammatory and a muscle relaxer. My lab results were a little unusual in that my WBC was 12.6 and my ANC was over 10. Whenever leukemia is present in me, my WBC is always high and my ANC is suspect. The doctor reassured us that it was probably a result of the wreck. Since my back and shoulder were bothering me he speculated that my body was calling in the reinforcements by making more neutrophils and white blood cells. He wanted to see me next week for another draw just to be safe, but I'll be having work done in Houston. He just wants to be sure that I'll have a blood draw. To be safe, he asked for a slide to be made up so he could have a look at my blood under the microscope. I got the call this morning that he didn't see anything unusual in the smear. Since Wednesday, I've either been high on ativan, or completely tanked up on muscle relaxers. I know I talked to a few people on either day and realize that I may have imagined a few conversations as well. If I said anything off base, or more ridiculous than usual, I have to apologize. Tomorrow I'm going to start making calls to be sure I haven't alienated any friends in my drug induced coma. The muscle relaxer puts me so far out of it that I decided to stop taking it during the day. I'll definitely take it at bedtime, but I'll reserve daytime dosing for really bad days. My Houston check-up has been moved to Sept. 23. The day kicks off at 7:15 and rolls along until the very late afternoon. Since we're driving in from Baton Rouge, Chris and I need to decide whether we'll drive in the night before and get a room, or leave at 2am the morning of. All is still well here. My shoulder started getting stiff and sore the other day, and I have to wonder if this is a remnant of the fender bender, since I don't really do anything active. The heaviest thing I picked up this weekend was my purse. I'm debating seeing the doctor about it, but know I should just to be safe. My poor hematologist/oncologist had no idea what he was getting into when he took me on as a patient. At least he has a great sense of humor and a good bedside manner. I received a call from my PA in Houston asking me if I could push my appointment this week to next week because my transplant doctor is completely slammed. Of course I said yes. So, now we'll wait another week for tests, etc. I don't know when the appointment will happen, but will post as soon as I do. As I get closer to my one year post transplant check-up my anxiety level ratchets up day by day. With the first transplant, my one year check-up was stellar. I hit all the milestones dead on and my team was pleased. Exactly one month later, the leukemia was back, angrier than ever. Funny how the doctors classify my type of ALL as angry. I've heard the bus and lightening analogies and all I can say is, yes, you can have the same bizarre accident twice. It's highly unlikely, but not unheard of. Every twinge and creak is suspect. An allergy attack signals armageddon in my head, but I do my best not to let it show, and I think I've managed to fool most. Please don't think I'm a quivering mess behind closed doors, I don't operate like that. My anxiety manifests in my mind, in the form of "what if" conversations, which I try to shut down as quickly as possible. The small fragment of logic that's ever present always says the same thing. If it comes back, we'll have it treated. Case closed. Everything else will fall into place. This week has been a bit of a trial for both me and Chris. In addition to the specter of leukemia, he injured himself on Monday and it was still bothering him by Wednesday, so he went to see a podiatrist for a second opinion. The doctor's opinion diverged from that of the clinic and he advised a slightly different treatment. Long story short, he pulled the nail. Chris hasn't been able to put pressure on the foot, so I've been on driving duty the last week. 4:30 am is not a pretty sight. Still feeling good about doing something so simply normal, I ran a few errands, then it was time to pick Chris up. While I was waiting at a red light, I was rear ended by the truck sitting behind me. I was in Chris's sedan, which sits pretty close to the ground. The other driver said he took his foot off of the brake, and voila, bumper sandwich. The car's bumper is a total loss and the truck hit the car with enough force to deform the trunk and hood. Chris's car is so well engineered that the front end of the truck looks like it's been rearranged by a psychotic child. The bumper is turned up at both ends in the semblance of a sickly chrome smile and the grille is fractured. Before anyone gets worried, I'm fine, just irritated. I got an estimate on repairs first thing this morning and am waiting to hear back from the other driver. He wanted the chance to come out of pocket for the repairs rather than take a hit on his insurance. Judging by the lengthy silence that followed the actual estimate, I'm guessing that he didn't think it was going to be that much. I have his insurance information and am waiting for him to call me back with a decision. The body shop needs to order the parts, but they won't until they get clarity on who will be footing the bill. Once the parts are in, the car will be in the shop for about a week. Although I'm irritated by the inconvenience, I'm grateful that no one was hurt, that Chris will recover from his injury and that life is just generally good. I'm surrounded by loving friends and family, have a great little house and amazing husband. Both cats have managed to be healthy this week and I get to enjoy another day of being. After all the bad jou-jou of this week I can still smile, because as a very sage man from the leukemia & lymphoma society message boards once told me, "A horrible dress rehearsal makes for a stellar opening night." I just have to believe that all of this week's inconveniences will add up to a very vanilla check-up and smooth sailing from here on out. Yesterday afternoon when most people were winding down from their Labor day celebrations, Chris and I were headed to the ER. For once in a very long while, I wasn't the patient. My poor sweet husband was clutching a bloody towel to his foot while I raced to the hospital. Chris slipped in the shower and caught his toe on the lip of the shower door, tearing the nail of his big toe partially off. When I saw the nail sitting sideways on his toe, held in place by the cuticle, I nearly vomited. I can have a coherent conversation with you while someone draws spinal fluid from my back. I can even tell jokes while a PA breaks fragments of bone from my hip for biopsies, but I absolutely cannot imagine the pain associated with tearing off a toe nail. The very idea of it makes me cringe. Of course the ER was packed to the gills thanks to the holiday and the fact that most doctor's offices were closed. Chris was uncomfortable with me sitting in the waiting room with so many sick people, so he sent me home while he waited to be seen. Since it looked like he was going to be there until the end of time, I stopped off at an after-hours clinic to see if they were open and if they had the facilities to treat Chris's injury. Yes and yes. Chris was seen at the clinic about two hours after we got there and by 8:45 I was dropping his prescriptions off to be filled. I had to drive him into work this morning and pick him up shortly before noon when he started getting sick from the pain killers. He keeps marvelling at the novelty of being looked after by me after having had to look after me for the last three years. It's such a normal, mundane thing, that I'm thrilled to be able to do it. Tomorrow is one year since I watched the large red bag of marrow be gently hung on Ann's IV pole by Dr. Andersson. I think back to all the craziness of that time, and in comparison to what life is like now and it feels like a dream. Hurricane Gustav was bearing down on us and I was being told that I would have to leave the hospital soon and leave Ann behind in the most vulnerable state I could imagine. I wanted to say thank you to the parents who donated her cords for the 1st transplant, but they did so anonymously...no chance to ever find out who they are. This time however, Ann has an adult donor that the NMDP has the contact info for and now we can. I have struggled with how to write a letter to her donor. I've drafted it and redrafted it time and again. But I still come back to the fundamental problem of how to say thank you to someone who has literally saved the life of the person you would willingly die for. 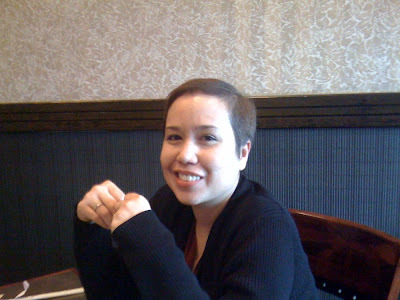 One year ago my wife was struggling for life, as leukemia destroyed her from the inside. I could only watch in despair as my best friend in the world and woman I loved gradually began to slip through my fingers. Because of my Wife’s cancer we needed a bone marrow transplant, but because of her race the chance of finding a donor was almost impossible. Our chances for a happy life together, to love each other, to one day raise a family, and to dream to do the small normal things that people do each day as a celebration of their love for each other were grim. Then something remarkable happened…you decided to step forward and through great selflessness gave us another chance. I can only imagine that the choice you made to donate was born out of hope and optimism, and oh how I wish I could show you all the things that have flowed from your choice. To say you have changed our lives forever is nothing if not the most remarkable understatement. Because of you I have enjoyed my Wife’s smile, her laughter, and a million small moments so precious that I would save them forever. Simply saying “Thank you” for what is the greatest act of selflessness I have ever seen seems too easy and far too small. I aspire to say something greater and more profound, something that carries the weight of everything I feel and care about. Something that celebrates your altruistic spirit and raises you aloft so you can be given the recognition such an exceptional person truly deserves. Without you our world would have come to an end. I feel a great grief in closing this, and feel my words have been fragile in the face of your overwhelming kindness. I hope that it is enough to say that you have given us not only life but also hope. You are my hero. I'm undecided as to whether or not this is good enough.